We all use smartphones and having an internet connection is what makes it "smart". If you have a limited data usage, then keeping track of the remaining mobile data is a bit difficult. My Data manager does this for you. 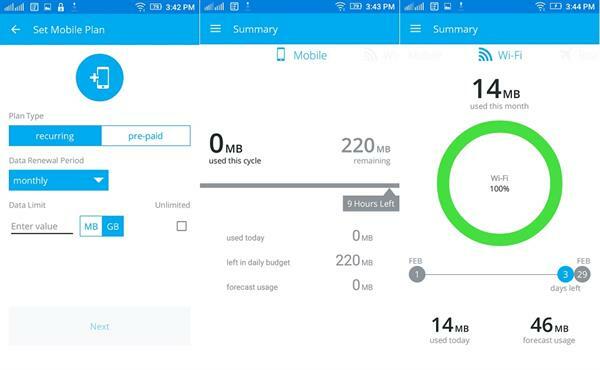 This application is available for both Android and iOS and helps you control the mobile data usage on your smartphone. Well, here is the review of My Data manager app. Keeping track of things are a bit difficult in this busy world. And if that is in case of mobile data of your smartphone, it is worse. What if I told you that there exists a manager that does this work for you. Let me introduce My DataManager. This is an application that does mobile data tracking for you. It alerts you if you exceed the data usage. The limit for the usage is set by the user. This application also lets you to track Wi-Fi data too. Here you can find the detailed features of the My DataManager app which is available for both Android and iOS. You can set alarms in condition when data exceeds over the usage limit and charges start applying. You can set custom usage alarms to prevent overflowing charges and shocking bills. There are many apps stored by you on your phone which use data on background and need to be stopped. This app tracks all apps using data so that information can be used accordingly by My Data Manager when required. That is it is called an app tracker. It allows data sharing too where you can share data with your family and track data usage in the same time too. It helps to manage data across multiple devices. It helps to track historical consumption to know whether you're on the correct data plan. One can also save money by maximizing their way of using data and get more out of present your plan. Helps you know that you've crossed data limit and prevents in spending more than your plan. Helps to identify what apps are consuming the highest data on your device. It is a free of cost app and easy to use and can be downloaded on any device. Finally, I will recommend you this great and easy to use app which has been designed firmly with graphs and charts to show you your actual data usage. You can use your data manager every day to track how much data you use and get alerts when you exceed your limit of usage. Be the part of over 1.5 million users by downloading this best My Data Manager app available on your Android phone to manage from anywhere. It can be used on any network but there are some specific networks where it works best.